At first, I was hesitant to order an engagement ring online without seeing it in person first and not to mention from another country. but its even better than I expected! I was so excited when this turned up at my door I literally ripped open the package lol! The packaging is beautiful in a gorgeous box with a nice comment/quote in French. The ring didn’t disappoint, its beautiful. 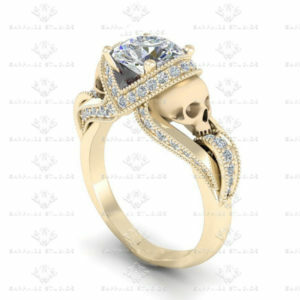 Good quality, stones are set well, super shiny and the natural diamonds are just stunning. I just find myself staring at it all the time!! The skulls are amesome!